In addition to delivering valuable benefits to the grid and cost savings to consumers, energy efficiency is creating economic opportunity for millions of Americans. 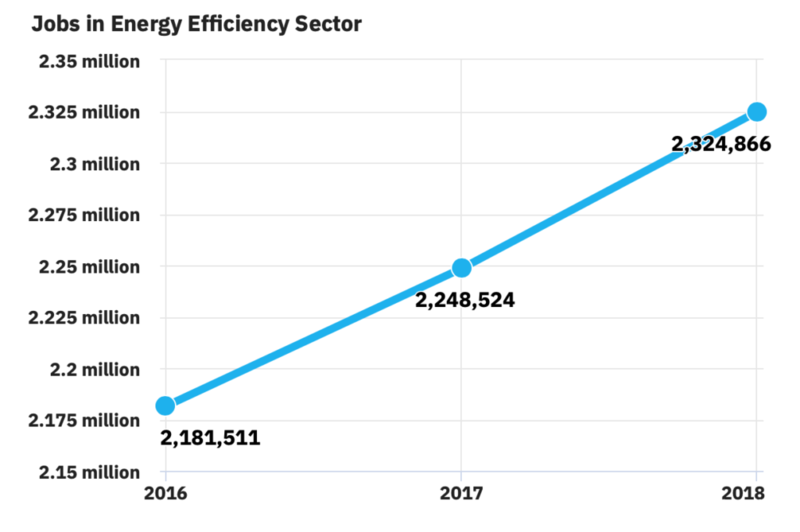 The latest U.S. Energy and Employment Report found a total of 2,324,866 Americans were employed in energy efficiency in 2018, putting it among the largest employers across all energy sectors. In 2018, energy efficiency added 76,000 new positions, making it the fastest growing job category in the energy sector for the second year in a row. The report, published by the Energy Futures Initiative and the National Association of State Energy Officials, provides an overview of employment and projected growth in key categories of the energy sector. The entire energy ecosystem currently employs approximately 6.7 million Americans, or 4.6 percent of the total workforce. Energy efficiency employment rose 3.4 percent over 2017 and accounts for more than one third of all jobs in traditional energy and energy efficiency sectors. The efficiency sector is projected to grow by 7.8 percent, or 180,000 jobs, in 2019. This is the highest projected growth rate across the energy economy. A majority of efficiency jobs, almost 1.3 million, are in construction, which is also projected to have the highest growth rate at 8.8 percent, although it also reports having the most hiring difficulty due to what employers say is a shortfall of workers with the necessary experience, training, and technical skills. Professional services in energy efficiency added 35,000 jobs, a 7.7 percent increase over 2017. Manufacturing jobs producing ENERGY STAR-certified products and energy-efficient building materials increased by 2 percent to a total of 321,582 jobs. Energy efficiency jobs outnumber electric power generation jobs in 48 states. In 15 states, efficiency jobs exceed fuel, energy power generation, transmission, distribution, and storage jobs combined. An independent report, published by E4TheFuture and E2 late last year, confirms these findings and provides additional insight into the jobs in the energy efficiency sector. The report found that energy efficiency workers now outnumber elementary and middle school teachers, and are nearly double the number of American who work in law enforcement. 11% of energy efficiency jobs are held by veterans, nearly double the national average for veteran’s share of employment (6%). Careers in energy efficiency are projected to continue strong growth as efficient technologies aid the global energy transition.